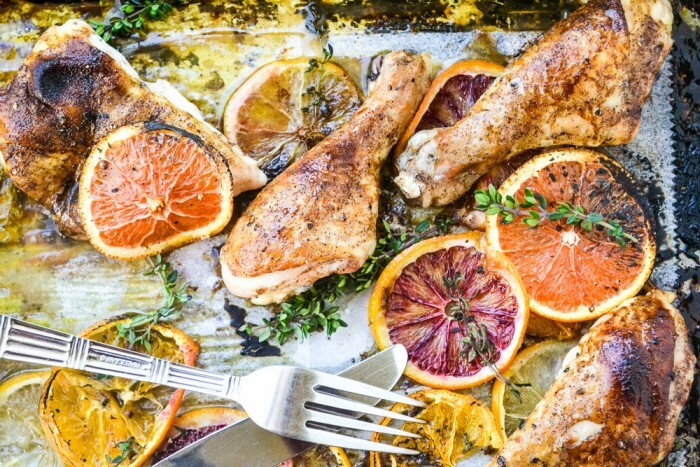 Roasted Chicken with Allspice and Citrus ~ this gorgeous sheet pan chicken dinner is a fabulous way to celebrate fresh citrus! 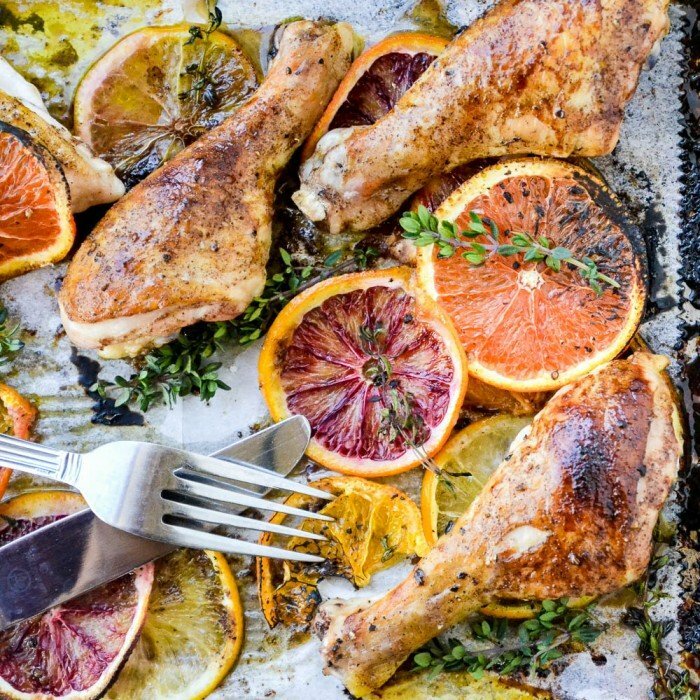 We all know that an extra hot oven does wonderful things to chicken, but did you also know that it has the same transformative effect on citrus? And isn’t it also wonderful that sunny citrus fruit comes into season right smack in the middle of winter, just when we need a little brightening. This dish not only cheers me, but actually helped to warm a very nippy kitchen today. I’d say it’s the perfect dinner to lead the charge into January. Like the vast majority of dishes I share here, this one is super quick and easy, in fact the hardest part by far is cleaning the baking sheet afterwards. Be sure to line it with parchment or foil because the natural sweetness of the citrus glaze will caramelize right onto the pan. In other words, what makes it especially delicious also makes it a holy terror to clean up. I love this beautiful chicken, I could eat it every night for the entire month. It’s not quite a 30-minute meal, but it’s darn close. It’s also a one pan wonder, the chicken gets nice and crispy golden without any pre-browning. I don’t bother to rinse the chicken beforehand, I like it to be as dry as possible because that helps the sauce cling to the meat, and it helps everything get nice and crispy in the oven. The practice of rinsing raw chicken is outmoded and isn’t necessary. In fact rinsing can actually spread any potential germs, which the heat of the oven will take care of anyway. So skip the messy rinsing, your chicken will be the better for it. 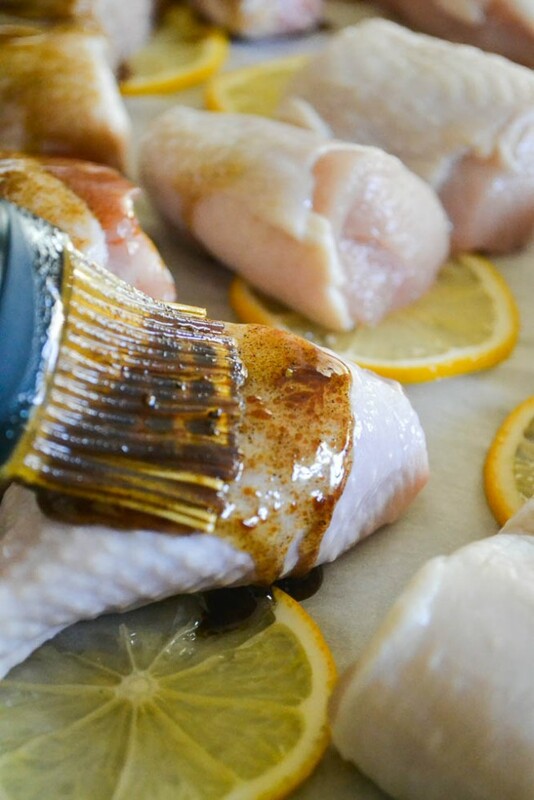 Whisk together the simple sauce, or glaze, made from olive oil, pomegranate molasses, allspice, salt and pepper, and brush it on the chicken. If you absolutely can’t find pomegranate molasses, which is pomegranate juice that has been reduced down to a thick syrup, I suppose you could substitute some lemon juice and honey, but I really recommend the molasses. The flavor is unique and really special. It will be in the International section of your grocery store, and Amazon always has it, in a pinch. The allspice adds a warm spicy clove type flavor that makes this dish so special. The sauce is inspired by the dressing on this Tomato, Onion and Roasted Lemon Salad. 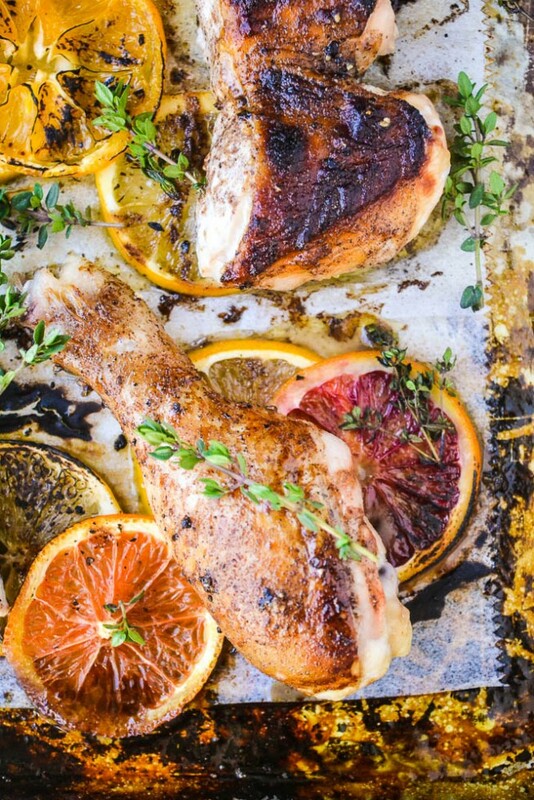 You’ll thinly slice your citrus and arrange them around and underneath the chicken. Finish with a good sprinkle of sea salt, fresh cracked black pepper and some fresh thyme. The hot oven does the rest in about 35 minutes. I baste the chicken with the remaining sauce once or twice, and garnish with more thyme. The citrus is sliced so thinly that it will caramelize in the oven, and it becomes soft and delicious enough to eat whole. 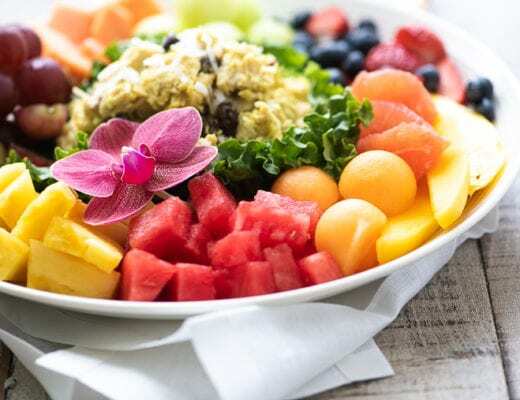 Because you will be eating the whole fruit, be sure to wash it well before slicing, and remove any seeds first. I sliced the fruit between 1/4 and 1/8 inch…any thicker and they will not cook through as well, any thinner and the slices will basically just disintegrate. I use an inexpensive mandoline slicer to do the job quickly and easily. I sliced up Meyer lemon, blood orange, Cara Cara orange (a pinkish sweet orange) and a Satsuma tangerine. Skip the grapefruit and lime, they’d be too bitter for this. Click here to see all my chicken recipes! about 6 legs and 2 bone-in skin on breasts (or you can use a whole chicken cut in pieces, or use your favorite parts, thighs would work) Allow 2 pieces per person. You could, if you have the time, marinate the chicken in the sauce. This isn't necessary, but it's an option if you are thinking ahead. Use bone-in, skin-on chicken…the meat will stay moister and you will get a great crispy brown result. Wash your fruit well with soap and water since you will be eating the rind. Organic is always a good choice. This dish requires high heat…make sure your oven temperature is accurate. I use an inexpensive oven thermometer (my grocery store sells them in the kitchen section) to check. 475F sounds high, but it’s the right temp for this dish. Line your pan with parchment or foil, otherwise the food will stick. And make sure you use a baking sheet with sides! I like to cut the breasts in half so the pieces of chicken are relatively the same size and will cook evenly. You can finish the dish under the broiler if for any reason you didn’t get quite enough charring on your fruit. 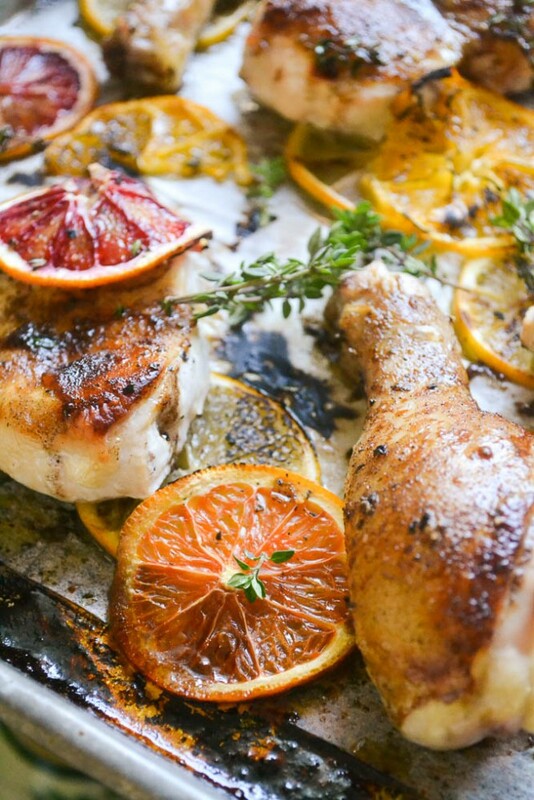 Don’t forget to pin this Roasted Chicken with Allspice and Citrus! 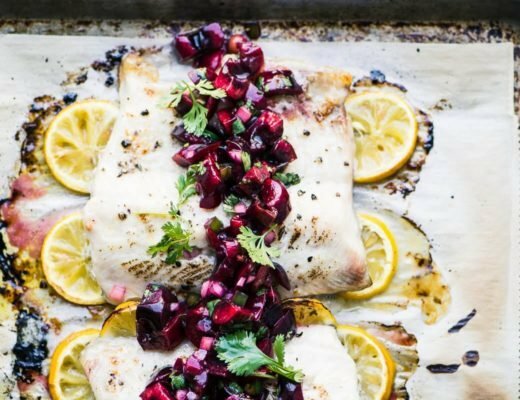 20 Healthy Sheet Pan Dinners for Busy Weeknights | Healthy. Delicious. 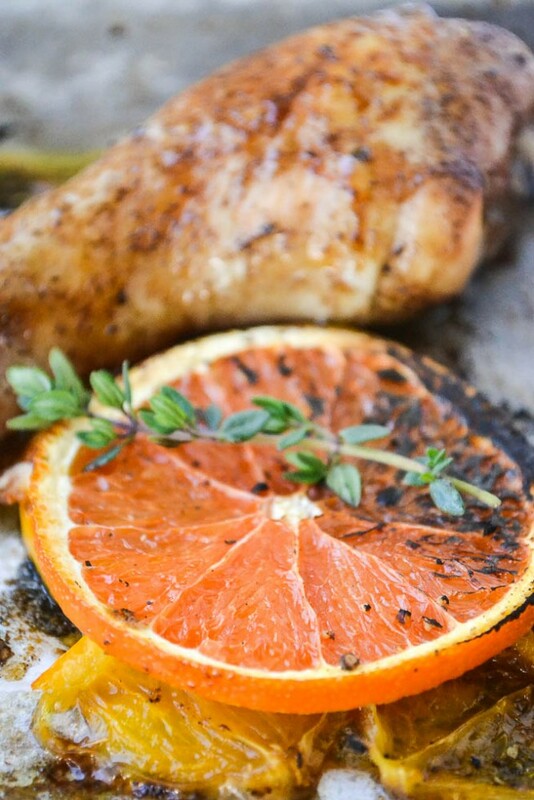 What a beautiful dish and perfect for the winter weather, I love the citrus and thyme with this! I am sharing your recipe on my recipe blog Easy 30-Minute Paleo Meals & Snacks Recipes ..
Used boneless skinless thighs and they came out GREAT. Pomegranate Molasses was found at Whole Foods so that made this super easy. The meat was moist and the caramelized fruit was wonderful to eat with it. I used a sharp serrated knife to cut the fruit as the mandolin did not like cutting fruit. I am looking forward to making this tomorrow evening for supper, however I could not find pomegranate molasses for the life of me. 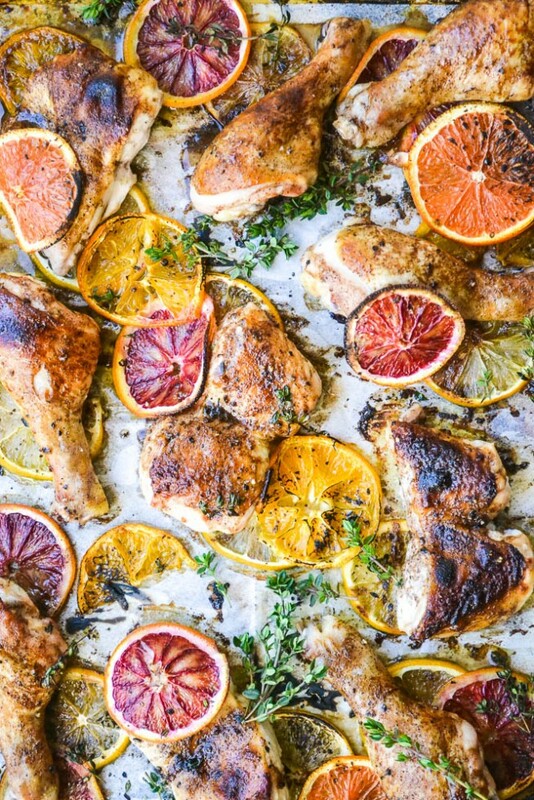 What would be a reasonable swap or an alternate sauce that would pair well with the citrus and chicken? Just place a 1/2 cup of pomegranate juice in a pan over medium heat and reduce it by half… I like to use a 10″ nonstick frying pan for reductions as the expanse of surface area makes to process go quickly. Just don’t let the reduction burn! Any suggestions for substitutions of the citrus if it cannot be found? I so want to make this dish this weekend, and was able to find the molasses in Denver, just not sure I will be able to find the citrus. Just love your blog and check it every day. Thanks for sharing all these great recipes, which I in turn share with my neighbors! You can use regular lemons and regular tangerines or another small orange, like clementines, Jane. If you can find Meyer lemons, that would be great. The key is to get whatever fruit you use thinly sliced. So glad you were able to find the molasses, you’ll love it! And thanks for the kind words! Thanks so much Carolyn, and thanks for the link. I also have a recipe for it on the blog, it’s incredibly easy! Just look at those colours! Wow, Sue! I can only imagine how crispy and flavourful that chicken skin! Adding it to my “make it soon” list. Gorgeous colour and flavour! I love the use of allspice. These photos are unbelievably gorgeous!!! i want to jump into the screen! Thanks for share, just beautiful! I don’t even eat meat and this is some gorgeous chicken! The colors are just stunning, Sue! Pinned! What a beautiful dish and perfect for the winter weather. I haven’t used pomegranate molasses in quite sometime but will pick some up. I’m assuming you used bone-in pieces. I over looked it if you said that. Really nice recipe. Thank you for sharing. Definitely bone in pieces for this dish, at least I meant to, I mistakenly picked up boneless breasts, but that was a mistake. The bone in keeps the chicken moister. Thanks Vicki! I agree the bones keep the meat more moist however if you used boneless chicken breasts with the skin on and it tasted great I’m all for it. My family prefers it that way, plus the cooking time is less. I think it’s a beautiful dish and look forward to trying this very soon. 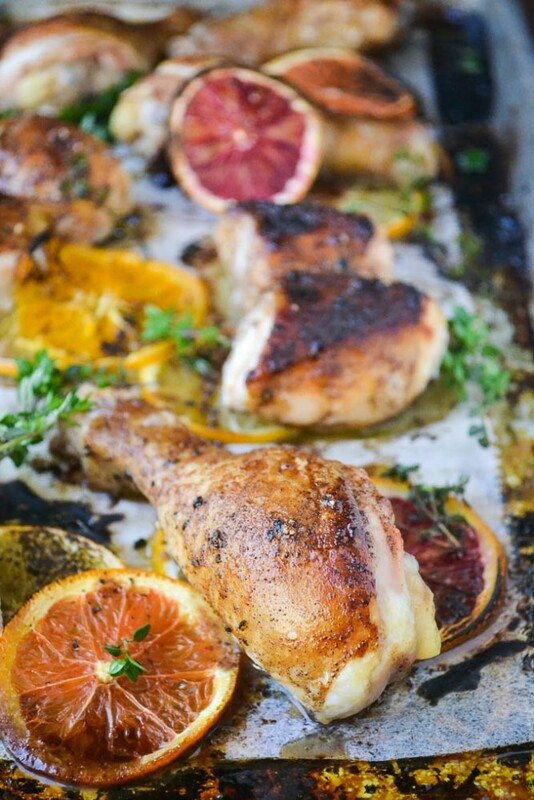 Roasted chicken has never looked so good, I love the citrus and thyme with this! Oh my this looks and sounds amazing! The photos are totally gorgeous! Looooove this. Oh my gosh, this chicken looks amazing!! 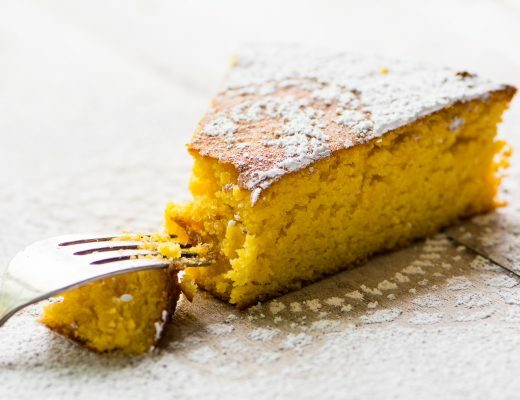 I am super obsessed with citrus right now, so I am definitely going to have to make this. You just made me change my grocery order to include all the ingredients for this recipe. What a gorgeous roasted chicken! Oh wow, that’s my goal! I hope you can find the beautiful citrus, it’s in all the strores out here in CA. Thanks for visiting Pamela! This looks amazing! So bright and healthy. Definitely going to try this soon! Wow! What a beautiful dish to start out 2015! Love citrus this time of year.